Easter has long been considered a time of rebirth and renewal. In late nineteenth century Russia, there was no better way to celebrate this Christian holiday than with the gift of Easter eggs. Family members would often be given eggs with small chocolates or other surprises inside. But for members of the Russian Imperial family, more was always more. So why would you settle on chocolate when you could give diamonds? Expanding the simple Easter tradition to extravagant extremes, the Russian Imperial family enlisted the help of the House of Fabergé to begin a tradition that would last a generation. The first Imperial Easter Egg is known as the Hen Egg, and was made of gold coated in white enamel to look like a real egg. When opened, the egg revealed a matte finish gold yolk, containing a hen wearing a miniature crown and pendant. This gift was such a success that Fabergé and his group of master artisans were given complete freedom over any future designs. Each Imperial Egg was uniquely designed to delight and surprise its owner. The eighth Fabergé egg, presented in 1892 on Easter morning to Empress Maria Fedorovna, was a gift from her husband Tsar Alexander III. This stunning jadeite egg with rose-cut diamonds contained an ivory elephant surprise tucked inside. The beautiful egg, known as the Diamond Trellis Egg, was kept at the Anichkov Palace until the revolution in 1917. Visitors can now view it on display at HMNS with other Fabergé masterpieces in the Fabergé: A Brilliant Vision exhibition. 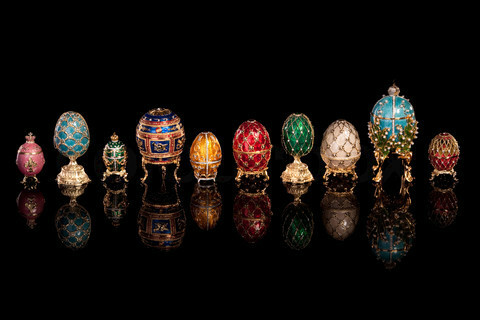 Learn more about the history and significance of Fabergé Easter eggs from collector Dorothy McFerrin in a presentation at HMNS on Mon., April 7 at 6:30 p.m. Click here for advance tickets. Come early to the presentation and do your Easter shopping! From 4 to 6 p.m., the HMNS Museum Store is hosting a special Fabergé Trunk Show. 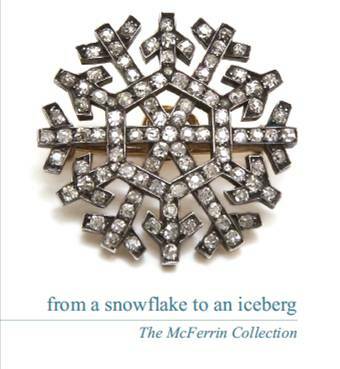 Featuring enameled egg pendants and other Fabergé-inspired baubles —the perfect addition to any Easter basket, ahem, — this Trunk Show includes a reception and book signing of From a Snowflake to an Iceberg with Dorothy McFerrin from 5 to 6 p.m. prior to the evening lecture, “The Splendor of Fabergé Eggs” at 6:30 p.m.